Once part of a Russian satellite nation that lived under communism for almost 40 years, today the Czech Republic is a member of the EU and enjoying a resurgence amid an Eastern European tourist boom. Surrounded by Austria to the south, Germany to the southeast, Poland to the north and now bordered by Slovakia (with which it formed the other half of former Czechoslovakia) the little landlocked Czech Republic is big on natural beauty as well as architectural treasures at almost every turn. In fact, the Czech Republic has been drawing visitors by the millions each year to its well-preserved ancient castles and cathedrals in its major cities, as well as its beautiful countryside perhaps best showcased at Sumava National Park. 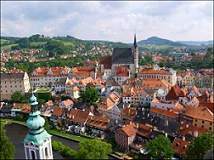 Besides the capital city of Prague, other popular tourist stops throughout the country including visits to famous Bohemian beer breweries and tours of Czech wineries and vineyards. sculptures parading on the hour. Prague, the vibrant and beautiful capital city, is for many visitors the first stop in the Czech Republic, irresistibly drawn to the city's rich history seen in its imposing castle, within which lies the tempestuously Gothic St. Vitus Cathedral. Next, follow the hordes of crowds of tourists to the front of Old Town tower to witness the twelve apostles and other sculptures - parading on the hour - around the upper tower of the old medieval astronomical clock. Stay awhile, and take the entire Prague tour in this eminently walkable city with its winding medieval Old Town streets and hidden courtyards to discover the city's underground music clubs and jazz cellars, as well as its trendy art galleries and glitzy shops as you make your way along the main commercial drag, Paris Street. Other Prague must-sees include its many museums of all descriptions, ranging from exhibits detailing city history to modern art. Also don' t miss a glimpse of contemporary architectural history found in the outrageously jazzy Dancing House by American architect Frank Gehry. For a relaxing afternoon to take it all in, also don't miss a view of the city from frequently scheduled boat tours along the Vltava river. CzechTourism.com - The official site, with special guides devoted to top attractions, romantic holidays, Czech Republic for kids, with practical travel tips, event calendar, photos & maps. Czech Republic Travel Guide - A complete country directory including travel facts & information, top attractions, hotel booking, maps, photos. My Czech Republic - "More than a destination guide" with extensive insider travel notes on Prague and top attractions in other major cities, plus a busy chat room, message boards, blog posts. Prague Tourism Information Guide - A complete guide to the city and its attractions with overviews of restaurants and nightlife, shops and markets, annual and upcoming events.